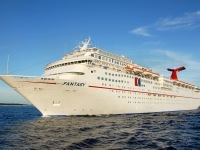 The Carnival Fantasy cruise ship will leave from the Alabama Cruise Terminal and sail under an agreement with Mobile City Council.The schedule starts in November 2016 and the 2,056-passenger Carnival Fantasy will offer four-day cruises to Cozumel and five-day excursions to Cozumel and Costa Maya or Progreso. Mobile's relationship with Carnival Cruise Lines goes back 14 years. For more information on the cruise lines email alabama@deep-south-usa.com.